From the traditional tweed-attired caddy, to the paper Strokesaver, mobile apps, laser range finders, and GPS – golfers have always sought ways of measuring distance effectively and giving themselves that much needed boost of confidence in knowing exactly how far they have to hit it (irrespective of how well they can then do so, but that’s another story altogether). Today, there’s something of a plethora of technological devices on the market. While they all have their pros and cons, you’ll find that most people looking for a bit of distance guidance tend to have their personal preferences – those in favour of the laser rangefinder (because they don’t trust the GPS), or those that favour the GPS (because they can’t get a rangefinder to work). These days, I don’t think either of those arguments carry much weight, but I will concede that both pieces of kit do still have a distinct advantage over the other. For instance, a laser rangefinder doesn’t work over the brow of a hill, nor does it give a yardage to the front or back of the green. On the flip side, the SW2 won’t tell you how far away specific trees and bushes are, nor will it give you a lay-up distance. Other SkyCaddie products do however, such as the TOUCH, or LINX GT. That said, when testing the new SkyCaddie SW2 watch, these comparisons weren’t at the front of mind. My more pressing question was whether I’d be comfortable ‘wearing’ the watch while playing golf. I’d always found a watch particularly uncomfortable to play golf in, and therefore never wore one. I was pleasantly surprised. For all the marketing spiel, I’ll genuinely concede that the curved and lightweight nature of the design meant that it didn’t bother me in the slightest when playing. I could go as far as to say that you’ll forget you’re wearing it, but that would defeat the purpose given that you’re meant to remember to look at it every few minutes. It’s something of a given that the device’s main attribute is the accuracy of it’s yardages, but the SW2 goes far beyond my experiences with GPS devices to-date. The very simple presentation of the ‘front’, ‘middle’, and ‘back’ of the green yardages make using it a seamless part of your golfing experience. There’s no need to push multiple buttons every two minutes, as it’s literally a case of choosing the course (which it will recognise for you automatically), pressing go, and then referring to it every time you want a yardage. The Intelligent Automation feature is also excellent in this regard, as it essentially recognises when you move between holes, and along the fairways. Plus, it’s worth noting that with 99% of the UK’s golf courses pre-loaded and 35,000 golf courses worldwide, the SW2 is just about guaranteed to recognise the course you’re playing! The yardages are incredibly accurate too, as SkyCaddie are the only brand to create, and frequently update their mapping on foot using professional surveying equipment. Looking beyond the yardages, I don’t know many people would wear a ‘GPS Golf Watch’ as a wrist watch, but for those that do, it tells the time. I guess that’s watch technology coming full circle! More cutting-edge, perhaps, is the facility to sync with the SkyGolf 360° App, which then allows you to keep track of rounds, club distances, and other stats, which is potentially a really useful feature. My personal view is that some of the extra functionality is more geared towards maintaining an edge on competitors than it is delivering valued benefits for the golfer, but that said, there are so many golfers fascinated with stats and technology that I am sure there are plenty who will make us of the bells and whistles. Either way, you can’t really criticise SkyCaddie for putting them there! There’s a pace-of-play timer, as well as a multi-sport odometer that tracks location, distance, time, laps, speed, pace, and calories burned during a run, walk or bike ride. It’s worth noting that the battery life is very good, with the GPS comfortably lasting through 36 holes and beyond, so if you’re still feeling energetic, perhaps you could put that odometer to work and record a few laps on the bike. As to my verdict, I thought the SW2 was extremely good. GPS may never convert those who will always be in the laser rangefinder camp, but this is a superb product in the golf watch market. Retailing at £129.95, it’s also very competitively priced. 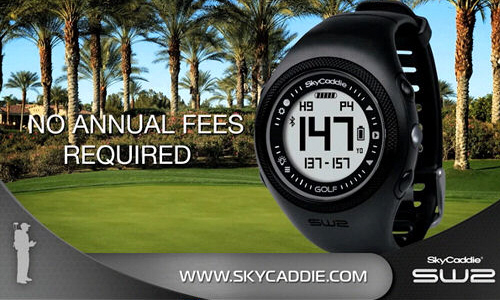 More details are available at www.skycaddie.co.uk.